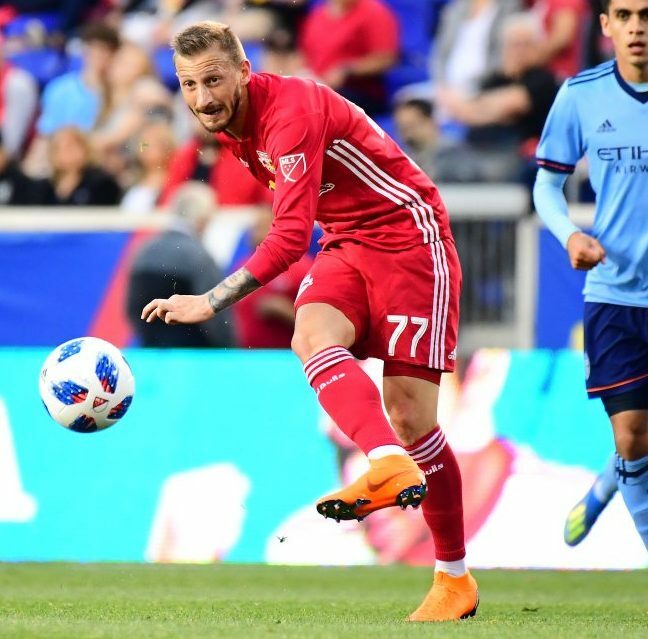 -Harrison, NJ—June 6, 2018– It was déjà vu all over again at Red Bull Arena Wednesday night, as the New York Red Bulls defeated NYCFC 4-0 for the second time this season, this time in the Lamar Hunt U.S. Open Cup. This is the second time the Hudson River rivals faced each other in the competition, the Red Bulls winning last season 1-0 in Harrison on a goal by Daniel Royer. The Austrian international would play a huge role again on Wednesday. Jesse Marsch continued the philosophy that has been so successful for him and this franchise over the last few seasons: rotate the squad to keep players fresh and give the younger players in the squad the opportunity to compete on the big stage. The Red Bulls manager left star striker Bradley Wright-Phillips on the bench in favor of Derrick Etienne Jr. and started two young players in the back line; Hassam Ndam who made his second appearance and first start, and Ethan Kutler, a recent signing from New York’s farm team New York Red Bulls 2, who was making his senior debut. However, despite the changes one part of the Red Bulls strategy remained constant; keep pressure high up field and cause mistakes from your opponent. Spoiler alert, it worked. Just like in the derby match on May 5th, it was the home side that would strike quickly when midfielder Vincent Bezecourt received a pass from Kemar Lawrence at the top of the box and buried a curling shot passed City keeper Brad Stuver to the bottom right corner. NYCFC’s troubles were doubled just four minutes later when they were forced into an early substitution as defender Cedric Hountondji was unable to continue. The visitors would recover nicely though in the next 20 minutes earning a majority of the possession but just could not find the final pass to give them a chance on net with good effort shown by their wingers Jonathan Lewis and Tommy McNamara. The Red Bulls would take back the initiative midway through the first half with a series of chances that had the City defense scrambling. In the 24th minute, Alex Muyl sprang Derrick Etienne Jr. who just missed his shot to the near post hitting the outside of the net. Muyl then squandered a golden chance of his own receiving the ball at the penalty spot off a counter attack, but his shot was fired just over the bar. City would surge again in the 32nd minute as a wide-open Tommy McNamara received the ball inside the box, but his shot was blocked by a sliding Kemar Lawrence. The visitors would get their best chance five minutes later when Lewis fired a shot that Ryan Meara saved low to his right. The rebound fell to star striker David Villa, who’s chip shot attempt was cleared off the line by a stretching Hassan Ndam to keep the score at 1-0 at halftime. The Red Bulls would double the lead just 6 minutes into the second half when German midfielder Marc Rzatkowski’s corner from the left found the head of defender Aaron Long at the back post for his second goal this season in all competitions. NYRB almost made it 3-0 in the 62nd minute when a free kick from the edge of the penalty area by Sean Davis found Ndam at the edge of the six-yard box but his shot was shanked wide. NYCFC would get a chance in the 70th minute to halve the deficit when the ball fell to Ben Sweat inside the box. However, his shot was palmed away by Meara and cleared by substitute Aurelien Collin. The Red Bulls would put the game to bed in the last 5 minutes of the match with a pair of goals by Daniel Royer. In the 87th minute Alex Muyl drove forward a Red Bulls counter-attack and laid a simple pass to a wide-open Royer on the left side of the box and finished it calmly into the bottom corner. The fourth and final goal would again be started by Muyl whose deflected shot fell to Royer for a simple tap in finish past a helpless Stuver in the NYCFC net. After the match head coach Jesse Marsch gave full credit to the club’s philosophy in having his side ready to go in what will be a busy couple of weeks for the shorthanded Red Bulls. “We’re the forefront of player development in this country…there’s no question that’s where we sit” said Marsch. With the win the Red Bulls advanced to the round of 16 for the 16th time in club history. The club will look to finish the job this season in the Lamar Hunt U.S. Open Cup after coming up just short as runners-up last season to Sporting Kansas City. The journey in the Cup will continue June 16th at 7 PM as they visit the Philadelphia Union. But for now, all of the Red Bulls attention will turn to a tough road test in Columbus on Saturday.